Once again we visit the genus Euonymus, with another popular but very invasive species. Wintercreeper, Euonymus fortunei, is native in East Asia, China, Korea, Japan and the Philippines. It was discovered in China by the Scottish plant explorer Robert Fortune (1812-1880) and distributed widely after that time. This plant is fast growing, evergreen, and very easy to grow; it tolerates most soils except swampy ones, has a wide pH tolerance, and does well in full sun to heavy shade. It thrives in USDA Hardiness zones 5 TO 8. 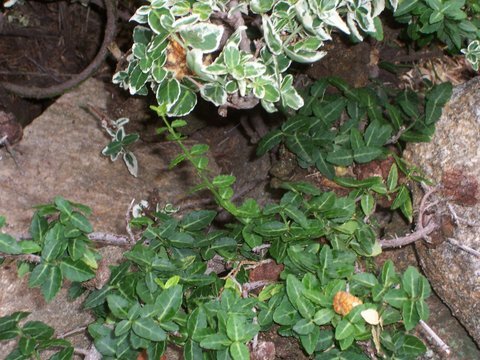 Wintercreeper can be a ground cover, a vine, or a small shrub, depending on its care and culture. No wonder it is so popular, with dozens of varieties or cultivars in the trade. The leaves can be dark green to bluish green; some varieties have silver veins, and some are variegated green and white, or green and yellow, and some turn dark purple in the winter. They are usually 1” long or less, oval shaped, have toothed margins, and are arranged oppositely on the stem. The mature plant, as can usually be seen at the top of a vining habit, has a differently shaped leaf. Only mature plants form flowers and set seed. The flower is inconspicuous. However, it is a thug and it took a while to recognize this. The mature plant’s seeds are enjoyed and dispersed widely by birds, squirrels, and deer, among others. It is an attractive groundcover, 4-6” high, or a small shrub to 3’, but easily escapes from where it is wanted and forms very dense thickets which crowd out native plants; its vine form can climb trees to a height of 40 to 70’, killing the trees by smothering their foliage. Wintercreeper is found in most of the Eastern United States to Zone 8. Euonymus fortunei is attractive not only to us gardeners, but to many insects and fungi as well. Scale is a very frequent problem as are Anthracnose, leaf spots, aphids and mildew. To control Euonymus fortunei, first of all, don’t plant it, especially where it might escape or be eaten by wildlife. Plants in small areas can be removed by pulling it up by hand, being cautious not to leave roots behind; they will sprout. Large area infestations and vines crawling up trees can be controlled by cutting them down and then spraying or applying Glyphosate (Roundup®) immediately to the cut stems. Mowing or weed whacking definitely makes the matter worse.